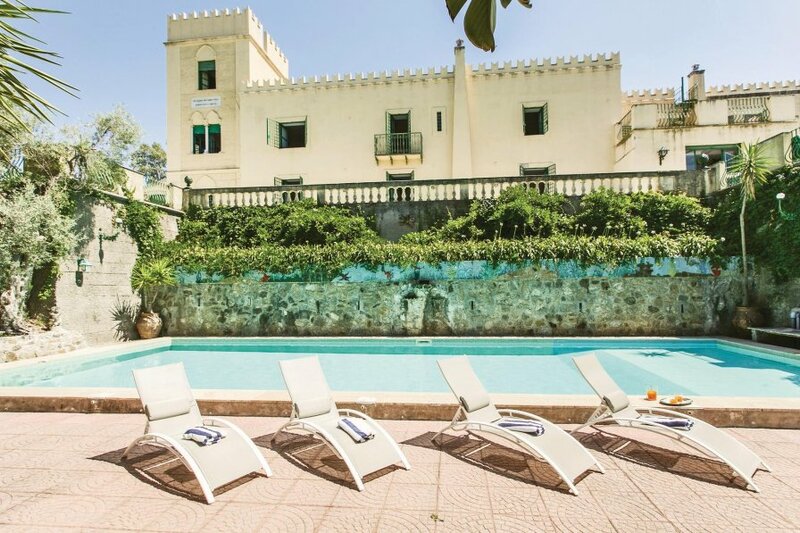 Mortellito Castle is situated on the sunny island of Sicily, on a hill in the middle of olive trees and lemon trees. On a clear day it is possible to see the Aeolian Islands from its windows. The actual owners, members of an old aristocratic family since 1447 have restored and improved it in the course of the years. The house has a magical atmosphere, a mixture of history and memories of the past, from the exquisite porcelain of “Doccia”, especially created for an illustrious ancestress to the many, signed photographs of the Italian Royal Family, who were friends with the family already since two centuries. The castle is surrounded by several large, sunny terraces, in the midst of palm trees, bougainvillea and giant sterilities. On one of them there is lovely pool (17x7m in size and 2m deep). The interior is filled with elegant furniture of exquisite taste, from the wide dining room to the wonderful library with many old and precious volumes. There is heating as well as air-conditioning. As stay at Mortellito Castle offers plenty of possibilities for excursions in the area, where there are many places of historical and touristic interest. The harbour of Milazzo is only 10 miles away, from there it is possible to reach the Aeolian Islands by steamboat or hydrofoil. This villa is made from brick or stone and was originally built in 1800 and refurbished in 2010. The agent has rated it as a three star property so it is a well-kept villa, equipped with standard furniture. It is also good value for money. This villa has a private pool and beautiful panoramic view over water; it is also located in Venetico, only 11km from Milazzo. It is set in a convenient location, 2km away from a sandy beach. There's also a restaurant 1.5km away. The villa is suitable for organising weddings and celebrations, organising cultural tours and family and friends vacations.